Christmas time to me is the time I connect with my past. The rituals of planning and decorating for the holidays makes this my favorite time of the year! The romantic notion of Christmas gives the best gift of all...memories. I relish all my fond memories of Christmases past. I try to recreate my favorite memories each year. Remembrances of spending a week in the kitchen surrounded by the smell of home baked cookies and cinnamon rolls. The joy of wrapping presents, especially when you know it's the perfect gift. Getting out cherished ornaments that have been decorating trees for generations! I love keeping up cherished traditions, but I always look for opportunities to create new ones. This year I'm adding a bit of romance to my decor. Thank you for stopping by for a visit to my home tour of Christmas home decorations and blog hop. I hope you enjoy your stay! A special welcome to those of you visiting from Martha at Simple Cozy Charm. Martha has the most beautiful inspirational design ideas! Janine at Happy Happy Nester is the amazing driving force of this fabulous blog hop, thanks Janine! So grab a cup of coffee, sit back and enjoy this inspirational Christmas blog hop! In the entryway I'm keeping it simple to greet my friends and family this season. Antique green gold tipped trees set this scene. I couldn't resist this adorable penguin when I was shopping at HomeGoods. I think it adds a magical element to my decor. I love the romantic look of a flocked tree. It doesn't snow here so of course my dreams are of a white Christmas. I added gorgeous florals to my tree this year. Sparkling silver ferns and coppery gold flowers. The other room decor I kept simple, I wanted the main focus on the tree. Chunky knits and faux furs are perfect for cozy nights spent tree-gazing. I love the main design of my mantel from last year so much, but I still made little changes for this year. Beautiful faux fur and velvet stockings add so much soft texture to the mantel. For a bit of romantic whimsy, I tied gorgeous ribbons casually to the stockings. A simple stack of birch logs with a faux sprinkling of snow completes the romantic rustic theme. I love having a tree in my bedroom! My bedroom already has a rustic romantic feel with the chalk painted headboard and pink quilt. This small flocked tree is irregular in shape making it look quite natural. The tree was decorated with old antique ornaments from my Grandma's tree. My Grandma was glamorous and had a pink Christmas tree. I treasure those memories of Christmas Eve at her home. 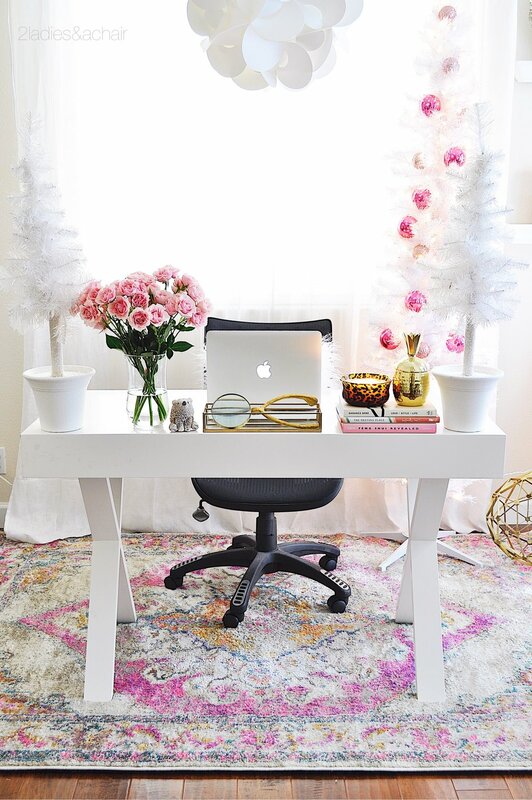 Simplicity in my home office! I keep the decor white, light, and bright. A few pink ornaments to echo the beautiful pink colors in the rug. The family room tree is themed red and black. In here I have kept the look casual and natural. It started with the ice skates on the tree. Just like if you were out ice skating on a lake, the tree is filled with natural bottle brush critters, natural fiber spheres, and black lanterns. Plaid, velvet, sweater knit, and even leopard throw pillows are the perfect cozy compliment to this tree. I appreciate you stopping by for a look at my Christmas decorations. In the coming weeks I'll be blogging about entertaining for the holidays. Scroll to the end of this blog and you will be invited to subscribe and be notified in your mailbox when a new blog is published. Now I know you want to continue this hop and see Jackie's blog at Finding Lovely. I love Jackie's gorgeous Christmas decor! I always pick up great decorating ideas from her! 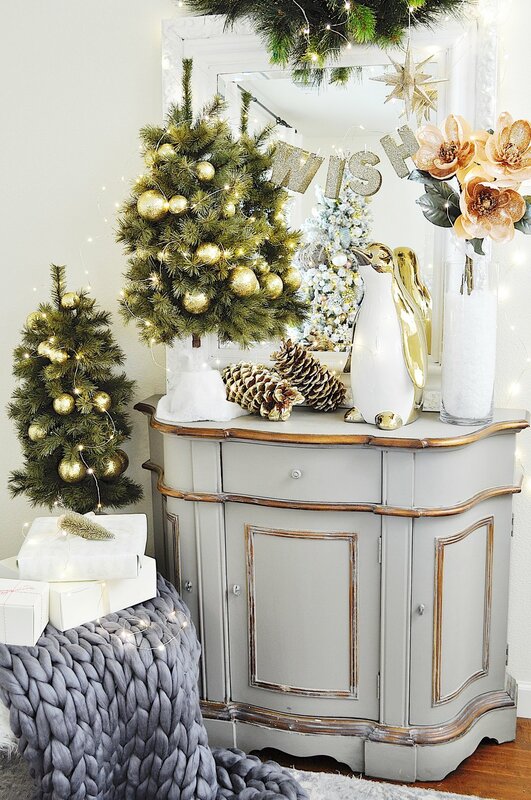 Here is the list of all the fabulous designer/bloggers on this Christmas home tour! Make sure to visit our Christmas Home Tours!